Its cheery song is smile-inducing, the return of its golden feathers in April adds to Spring’s color palette, and its frequency and acrobatic skills at the feeders make it a constant joy to watch. 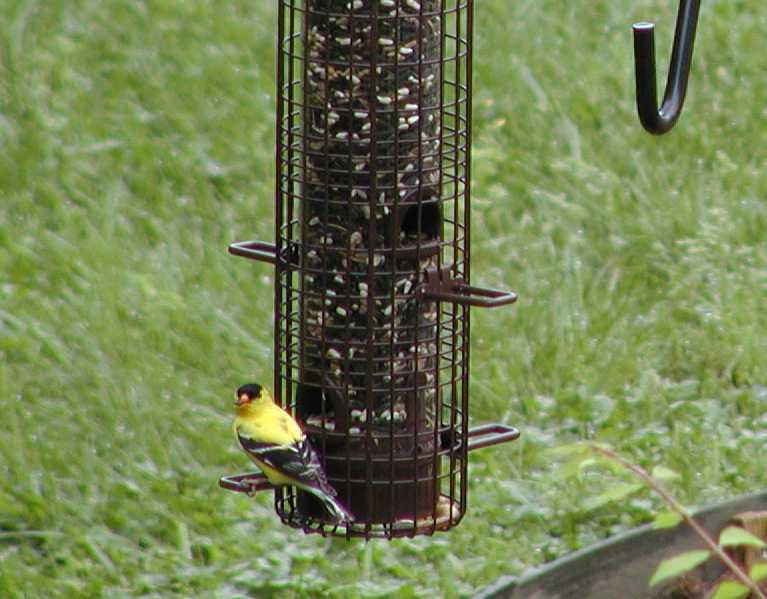 What’s not to love about the American Goldfinch? 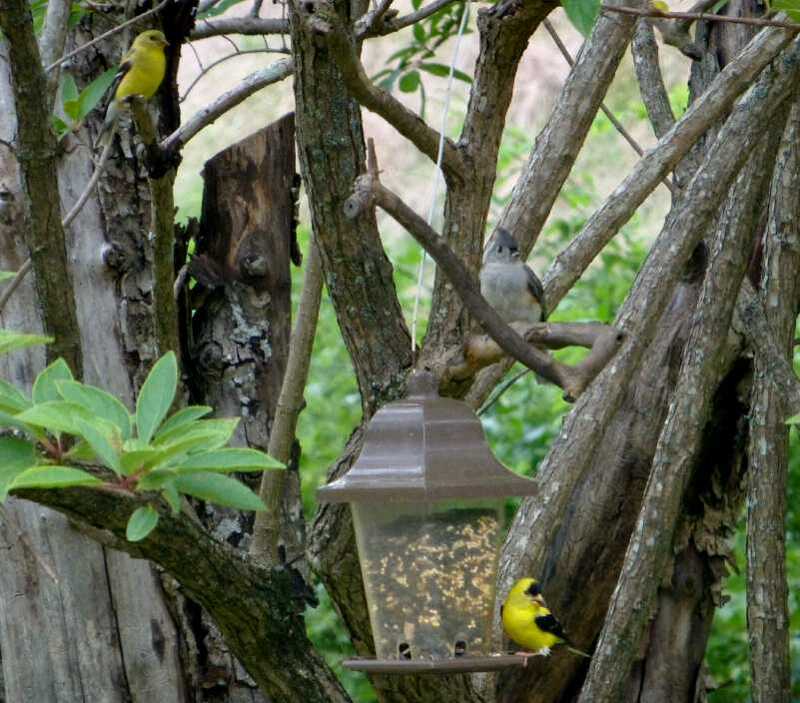 The second most-photographed bird at the Inn on Mill Creek (after our unofficial mascot, the ever-entertaining Tufted Titmouse), the American Goldfinch is also one of our most asked-about birds. So let’s give the goldfinch its due as the featured bird in the month of April in this year’s12 Months of Birding at the Inn series on our blog. In the mornings, especially in spring and summertime, if the feeders are empty, you’ll hear a symphony of warbling and twittering. That would be the American Goldfinch gang waiting for Innkeeper Brigette to serve them breakfast. The goldfinches love to entertain guests who are eating their own breakfasts in the dining solarium at the Inn, which has a front row seat to the feeders. Goldfinches have quite the personality, acrobatic skills, and can hang out in large groups, so it can be fun to watch them trying to share the birdfeeders. In terms of food, they love nyjer (thistle seed) and sunflowers. 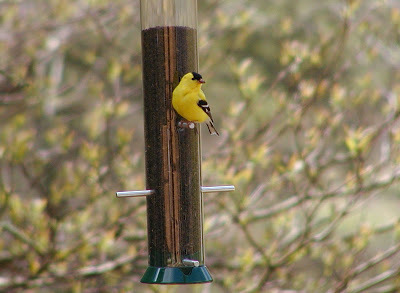 Interesting fact: American Goldfinches are vegetarians and therefore don’t eat insects like many other birds. Male American Goldfinches are easily recognizable in warm weather months, with bright yellow feathers, black wings with whitish wingbars and a black cap. During the winter months, their plumage is dull brown. Females are also a muted color, yellowish olive, all year long. 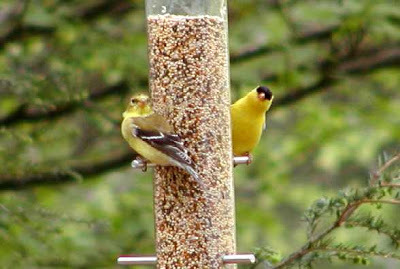 In Spring, the yellow feathers return and its not uncommon to see patchy yellow goldfinches. 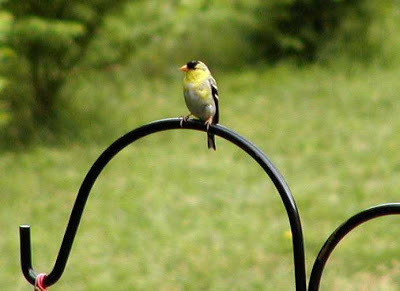 Our favorite photo of an American Goldfinch taken at the Inn is this one, which shows a goldfinch with what looks like a little heart filled in in yellow on his chest. Adorable. 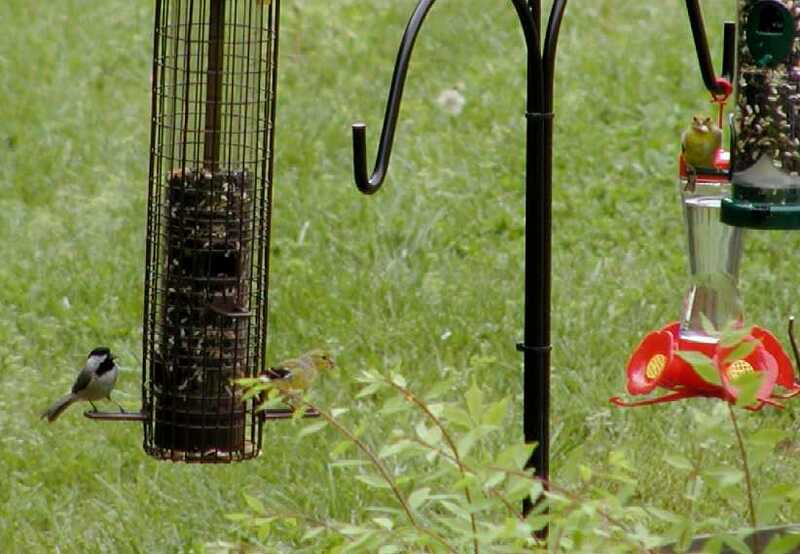 We have had some in the Rocky Mount, NC area already and they were eating up the feed in the sock like feeder, then suddenly they have disappeared. What causes that and is it normal? Hi Glenda, we’re wondering if maybe what you saw was an irruption of Pine Siskins. They look similar to goldfinches in the late winter before the male finches get their gold feathers again. Goldfinches are mostly year-round residents of the area, while siskins are nomadic and you can often see large groups of them (called irruptions) at your feeders this time of year. They love the same kinds of seed as goldfinches, too. One suggestion is to check with your local Audubon Society chapter to see if they have any information that would be helpful in answering your question. Happy birding!